Sri Lanka Massage Places and Ayurveda Spa's Information Directory: Suvasavi Spa and Ayurvedic Treatment Center - Mount Lavinia. 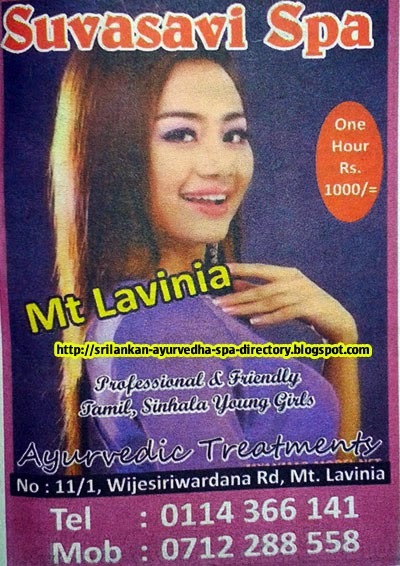 Suvasavi Spa and Ayurvedic Treatment Center - Mount Lavinia. Suvasavi Spa and Ayurvedic Treatment Center, No. 11/1, Wijesiriwardena Road, Mount Lavinia. Nice blog,thank you for sharing. Sri Lanka gains income from tourism as well as spas. It has number of good spa and other as local business. Our site, massage in Colombo plays a role to provide information as directory. Sometimes, we do review rating and guidance to those who seeks spa services in Sri Lanka, especially in Colombo.